Michael Gungor and I started The Liturgists because we were lonely. Sure, we talked a big game about creating beautiful, sacred art, and exploring how science and faith are complimentary lenses to view the world. More than anything, though, we were just lonely. We were lonely because the Church is in the middle of a Reformation. It's been a few hundred years, so God knows it's past due anyway. The world is changing again. Science has pressed farther into the claims of theology than ever before. Culture (rightly) questions some of our most basic assumptions about what scripture teaches us and why it matters. I see this as a good thing. The way church is done today works for hundreds of millions of people world wide, and I celebrate that. But, it's also true that hundreds of millions of people can't find a seat at this table because they can't read the Bible the way they used to, or because they're gay, or because they struggle to believe a good, loving God can be present among all the suffering and tragedy found here on Earth. They are hungry. So were we. That's what The Liturgists is about–it's the work of the people. It was never meant to be a platform for Michael and I, but instead a table meant to welcome all, just as they are, to come and break the bread of Eucharist together. We want to help the spiritually homeless and frustrated find community and peace. Too often, people find themselves marginalized by their peers when they start to really wrestle with their faith. Sadly, many people find themselves passively ostracized or even actively cast out when they can't accept the same answers they once did. But we believe that the Gospel is messy, and that the Gospels themselves describe a community that didn't have all the right answers, and didn't always make the right choices, but was united around a love of a particular person. And so, we welcome all those people who want to follow the one who was called the Son of God. Even if they don't know why–and even if they aren't sure he ever existed at all. We've done a lot to build a community like this. We've done events centered around liturgy. We've created liturgies people can get on the Internet and practice alone or in small groups. We host a podcast to foster these kinds of open, safe discussions. But we aren't done. We're gathering together in Atlanta for an event called Belong. It's our first conference; a two-day discussion of faith and doubt, science and art, safe community and challenging ideas. Some familiar voices from our work will join us, and we've got some really compelling ideas to share. But most exciting to me is you. The listeners of the podcast, the practitioners of our liturgies. I'm most excited about sitting in a room with 100 of you and learning about your journey and your story. I can't wait to see what happens when a room full of people realize that they are not alone. Tyler said, "I've been trying for a while to find a way to facilitate open, honest discussion about spirituality and God in some forum in my hometown, for artists/musicians, while also bringing Christians into a place where they don't feel like they have to use their gifts to to make sterile, uninspired work "for he church" or otherwise. It's hard to do, and hard to figure out the best shape for such a thing to take. I signed up because I think Belong can facilitate my brain in that process, and because I want to spend two days talking about the most interesting and wonderfully confusing things possible with people I consider to be tremendously inspiring." Emily said, "I'm basically in the middle of a faith deconstruction and have found it an incredibly lonely experience - a truly important one but lonely for sure. I found the Liturgists near the beginning of this journey and Science Mike's podcast about the same time. I find the ideas and discussion to bring freedom and breathe life into me in ways I didn't think were possible. Just knowing there are people out there who grew up in evangelical fundamentalism and have figured out how to step somewhat away from that and still love Jesus deeply is incredibly inspiring. I want to meet this community of people that love these discussions - to participate, be part of it, and hopefully, give a little bit back to the people who have given so much to me." Matt told us, "I am a worship pastor in Texas at a (ready for it??) Southern Baptist church (don't worry, I'm not THAT kind of baptist) and I love the people and am always seeking how to love them better through pointing them to God (via music, art, etc.) beyond the concepts and language they may have used to close themselves off to a God that transcends modernity. I look forward to great discussion with some of the most influential people in my life and ministry on how to do this well, contextually, authentically, and pastorally; as well as be encouraged to be a better artist/creator. I am so thankful this is a thing. Its refreshing that we can talk openly and grow together." Thomas said, "I am the science department chair at a Christian high school in the Atlanta area and the intersection of faith and science is the most fascinating thing in the world to me. It is my mission in life, to help kids see God through the study of the natural world." Jillian said, "The Liturgists podcast was a lifeline for me in a period of traumatic loss of faith. When I started to regain my faith, I found great comfort and encouragement in your blog at mikemchargue.com. I have a wonderful support system at home, but they have no framework to understand or respond to the questions I want to ask now. I am looking forward not only to exploring my own doubts and beliefs with people who can relate, but also to hearing questions I may not have thought of before." I was moved to tears when we opened up registration and thousands of people flooded our system from all over the country. We didn't really know what to expect, and we certainly didn't know people would fly to Atlanta from all over the country to be a part of this. This won't be our last Belong–we're going to experiment with event size and ticket price to make room at the table for as many people as possible in the coming months. But this is the first, and the first one is always special. And there's something about a crowd of 100 that is remarkably intimate. There are a few seats left for Belong, and we'd love for you to join us. They transport us across state lines like vampires. 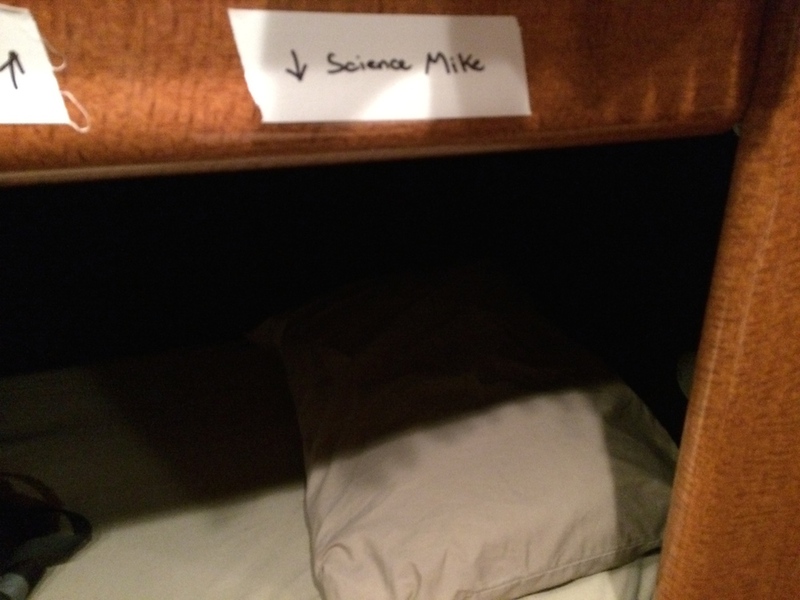 We sleep in bunks shaped very much like coffins, sealed with blackout curtains. These bunks number twelve: stacked three high, two deep, and on both sides of the center aisle. This part of the bus is sealed by pneumatic doors, so no light gets in at all. It's perfectly dark no matter when you wake up, so it only takes about a day to lose all sense of time and space. Each "day" begins with unanswerable questions. What time is it? What day is it? What city am I in? You sneak out of your bunk and open the door, and the appearance of the curtains lets you know if it is day or night. Most of the time it is day and sometime in the afternoon. The crew is already gone–these are the hardworking souls that make events happen. In many ways, we performers are just icing and decorations on the cake that they bake all day. Most of the time, it is a venue and not a hotel that is visible when you peak outside. That means today's shower will happen after the event, and this is a harsh reality of touring for a man like me who's days are anchored by a shower that happens minutes after leaving the mattress. It is in this foggy, discombobulated state that events put on by The Liturgists are born. We're a collective of creators anchored by Michael Gungor, of the band Gungor. On this trip we are joined by members of The Brilliance, as well as me–the nerd who has no musical responsibilities in the event. My job is to narrate, and to inject my particular mix of science and faith into the consciousness of people who come out to one of our events. In time, other people will join us–but I can't ruin the surprise in this blog post. We don't put on concerts, and you'll notice that I have been careful to avoid that word. The Liturgists invite people to participate in Liturgy and create Liturgical art–which is to say we create art and resources specifically for the Church. Our first liturgy is Vapor, available now on our website (for free) and iTunes (not as free). The live execution of Vapor is a 70 to 90 minute experience where identity is intentionally surrendered as we invite everyone with us to focus completely on God. The only way we can make it work is to start by explaining that we're doing things differently tonight. We have to warn people that the expectations that have been built up about concerts and church services have to be set down for this to work. We let them know that this night will be a boring failure if they don't participate with us. Miraculously, people both churched and unchurched have proven themselves remarkably enthusiastic in answering this challenge. It has been humbling for us all. After this introduction, Michael asks me to share my testimony of faith lost to atheism and then found again through a direct experience with the power of God. Then David Gungor and/or Lisa Gungor share a few words from their hearts before I start the scripted portion of the event by asking for a volunteer from the audience who does not have fake fingernails (fake fingernails will ruin the science experiment we're about to perform). From that point forward, the band is hidden behind a giant screen. We light them in such a way that their shadows appear on the screen, while we also project words and images that relate to the music, prayers, readings, and other liturgies that occur in the program. It's a way to divorce the identity of the artist from the art that they produce. We were worried that this wouldn't work–that a giant screen would be boring. I realized the power in metaphor as I've watch people move into periods or real contemplation, lament, and worship. It seems that people are hungry for something like this, something where the goal is not to lift up a group of people above the rest. We end with Eucharist, the ritual that ties all of Christianity together, all the way back to one room on the night Jesus was betrayed. At events smaller than 500 people, I serve communion to people and it is deeply moving to see people respond. Some tell me afterwards that they have been struggling with their belief, and that this moment opened something in them. I can understand that–it was the Eucharist that brought me back from my doubts. Then it's over, and we talk to people while the crew takes down all the elements and packs them into a trailer. Most nights we stand around for 45 to 90 minutes. Then we shower and load the bus for a time of celebration and reflection. Finally, we crawl into our bunks, like vampires hidden from the light. Tonight is our last event in the first sequence. Other dates are being booked, but I don't know when or where they will be. 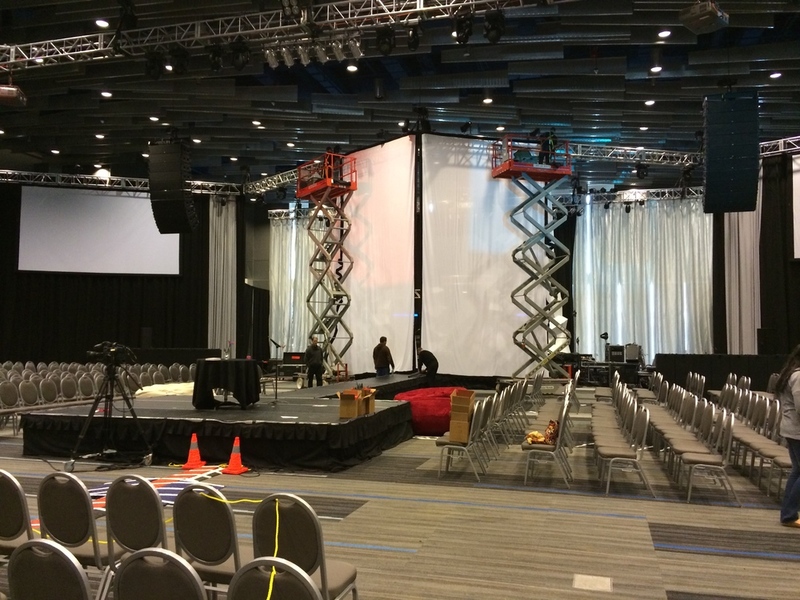 I'm really excited about this last event–it's in a really big room at a conference in Columbus. I've been thinking a lot today about all the people we've met, from the tiny little space where we first tried out our program in Nashville, to the beautiful church just a few blocks from ground zero in Manhattan, to a college in Nyack, to Browncroft Community Church in Rochester. All these people showed up to an event that started out confusing and strange. But, they were patient, and they were willing to try and focus their hearts elsewhere, to focus on the God that all Christians worship. So many people have offered me joyful, tearful, or stunned accounts of what happened in their hearts during our liturgy together. Typing these words brings tears to my eyes, because I know what it's like to hunger for a more personal experience with God. And here, this week, people from all different denominations, political affiliations, social and economic backgrounds, and even people who do not believe in God at all gathered together at one table to celebrate the gift of life and the gifter who provides it. I have never been more excited about Church. There's a lot going on in March, and I'd love for you to be a part of it. I'm giving a talk about knowing God in an age of science on March 2. It'll be at 6:00 PM at Good Samaritan United Methodist Church in Tallahassee (down by Southwood). I'll talk about my experience rediscovering God after atheism, and how we reconcile the teachings of the Christian faith with the insights offered by modern science. I don't get to do many events at home, so I'd love to see all my local friends and family at this event. If you're near Tallahassee, Wake Forest, New York City, Rochester, or Columbus, I'd love to see you next week.